Have Some Furious Fun with Our Badass Dragon Name Generator! Do you want breath that can burn through concrete? Do you have a passionate desire for gold? Does soaring through the sky as a magisterial creature of the air sound like an awesome time? 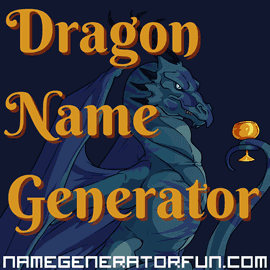 If so, then give in to the call of the dragons, with our dragon name generator! We created this generator in 2012. We wanted to build something that made names suitable for the epic Dungeons and Dragons campaign we were playing with our friends, but that would also work for World of Warcraft and other online RPGs. The dragon artwork is by an awesome artist friend of mine called Jamie Carr, who was part of that epic Dungeons and Dragons campaign! Why are myths about dragons so universal in human cultures? According to anthropologist David E Jones, it's because dragons are an imaginative amalgam of all of our natural predators. They resemble big cats, venomous snakes, and predatory birds all at once. When we lived in trees hundreds of thousands of years ago, these predators were our biggest threats, and fear of them is programmed deep into our DNA. Dragons are also associated with fire, and often dwell in deep bodies of water - two more natural threats to our safety. In Akkadian and Mesopotamian mythology Ušumgallu, Bašmu and Mušmaḫḫū are three dragons or serpents. Ušumgallu means "great dragon"; in Sumerian and he is usually described as a dragon-lion demon, Bašmu means "venomous snake"; and he is described as a horned snake with two forelegs and wings, and Mušmaḫḫū means "exalted serpent" and he is described as a hybrid of serpent, lion, and bird. In ancient Babylonian mythology, the goddess of the salt sea is depicted as a gigantic sea serpent called Tiamat, who mates with the god of the fresh waters called Abzu or Apsu, who is depicted as a lion-like winged creature. Together they create the younger gods, who later kill Abzu to usurp his role as lord of the universe. Tiamat is enraged and creates the first dragons, filling their bodies with venom instead of blood. Dragons are even depicted in the Bible. In the Book of Psalms, the sea dragon called Leviathan is slain by Yahweh as part of the creation of the world. In Revelations, the author describes a creature he calls the Great Red Dragon, which has seven heads, ten horns, seven crowns, and a massive tail. In Ancient Greek mythology, a dragon-like monster called Typhon who has one hundred serpent heads that breathe fire is slain by Zeus, whilst the similarly named Python, who is depicted as a serpent or a dragon that lives at the centre of the earth, is slain by Apollo with poisoned arrows. Heracles, meanwhile, is the slayer of a water dragon with many heads called the Hydra of Lerna. In the Anglo-Saxon poem Beowulf, Beowulf battles with a dragon who is angered by a slave stealing a jeweled cup from its lair. Contrary to popular belief, the dragon is not Grendel, or Grendel's mother, these two monsters are thought to be giants who are the descendants of Cain. Perhaps the most famous legend is about a dragon who plagues Silene in Libya. It lives in a pond and spews venom that poisons the countryside. It is slain by Saint George, who happens across the dragon just as the princess of Silene has been left as a sacrifice. Saint George spears the dragon with his lance and then leashes it with the Princess's girdle and leads it back to Silene. The entire town agrees to convert to Christianity when George slays the dragon. China has a vast and fascinating mythology about dragons, where unlike the rest of the world they are seen as positive forces and symbols of luck and prosperity. There are many dragons in Chinese classical texts, and they often derive from the suffix -long, which is the Chinese word for dragon. Dragons in Chinese mythology include Tianlong (heavenly dragon), Shenlong (god/thunder dragon), Fucanglong (hidden treasure dragon), Dilong (earth dragon), Jiaolong (crocodile dragon), Panlong (coiled dragon), Feilong (flying dragon), Qinglong (azure dragon), Qiulong (curling dragon), Zhulong (torch dragon), and Chilong (demon dragon). Some names derive from the prefix long-, such as Longwang (dragon kings), and Longma (dragon horse). Other dragons do not have long as part of their name. For example Hong (rainbow serpent), Shen (giant clam, sea monster), Bashe (ba snake), and Teng (soaring snake). One interesting British legend is a story about a dragon called The White Worm, or The Lambton Worm. According to local folklore, the young John Lambton from the Lambton Estate in County Durham was a rebellious fellow who missed church to go fishing in the River Wear. John catches a small eel-like creature that he declares to be the devil, and he throws the eel down an nearby well. Years later, John goes away to fight in the crusades. Meanwhile, the eel grows into a huge white serpent that poisons the well and eats the livestock. The worm emerges from the well and wraps itself around a local hill seven times. The White Worm terrorizes the area for a number of years until John returns home and vanquishes it by covering his armor in spear heads. If you enjoyed this page, you might also enjoy creating names for pirates, fantasy humans, World of Warcraft, or Lord of the Rings elves. Image Credit: Dragon by Jamie Carr.